… and I missed it all. Somehow I managed to leave Melbourne before it got above 25C, and landed again about an hour after the cool change. I say cool change: it went from 44.4C at 4.30pm, to 32.2C at 6.30pm. Not exactly cool, but welcome relief. Putting this into context, about 27 people died in South Australia over the week due to the heat, and an area of Victoria about the size of Manhattan was ablaze, reducing 23 homes to rubble. About five minutes before the taxi dropped me home, the power went off. So even though it was a balmy 30C outside our house was still somewhere around 44C. Minutes passed and we decided to walk down to Footscray for dinner. 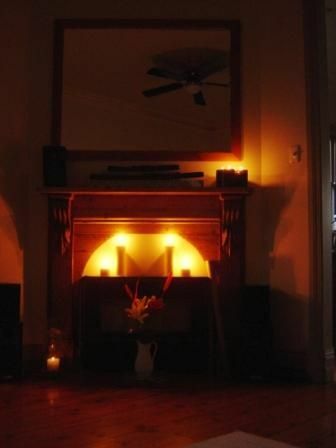 Most places were shut down as the power cut hit most of the western suburbs. Some drunk guys sat outside a pizza place yelling abuse at passing motorists. The traffic lights were out, so cars were doing what Annette would call shopping trolley manoeuvres at every junction. Happily our local place was open, serving only dumplings. We sat mopping our brows and ate two plates of dumplings, one seafood and one pork. As we strolled home the lights came back on. The pizza place guy heaved a sigh of relief and ushered his staff back to work from their seat on the pavement with mobile phones stuck to ears. We opened all the doors at home and waited for the coolness to pervade. It took all night. FoodYes, the food is similar. We have fish’n’ chips, meat pies and pasties, takeaway pizza, sausages on the barbie. So far, nothing spectacularly different. But on top of that there are so many new things. Melbourne is a gastronome’s paradise: there is even a permanent newspaper segment called Epicure dedicated to all things gourmet. There is an infinite number of places to have breakfast in Melbourne, even out in the suburbs. Whilst now and again we miss the honest fare of a good London-Greek caff or a full Irish breakfast (aah, how I miss Irish sausages and decent brown bread), even close to work I can sample divine French toast, fruit-laden raisin breads, omelettes, eggs benedict, home-made muesli, porridge with banana, and of course good coffee. Melburnians take their coffee extremely seriously. Not for them a Starbucks at every corner: the local cafes and even train stations serve the very best espressos, macchiatos and café lattes. Starbucks is here, but tolerated rather than revered. Good delis and markets are never far away. Footscray Market is our local, dominated by Vietnamese and Chinese food but boasting the very best fishmongers and butchers not to mention fresh fruit and vegetables. It is mentioned in Rick Stein’s “Food Heroes” book as an excellent source of fresh produce. Victoria, Prahran and South Melbourne Markets are just as good, with famous dim sims at one (larger versions of Chinese dumplings) and a great organic produce section at another. Melbourne also has a burgeoning Slow Food culture too. The state of Victoria alone has five Slow Food convivia, and coming up soon is A Taste of Slow, two full weeks of quality food and wine, with a focus on seasonal, regional and traditional foods and boutique wineries. 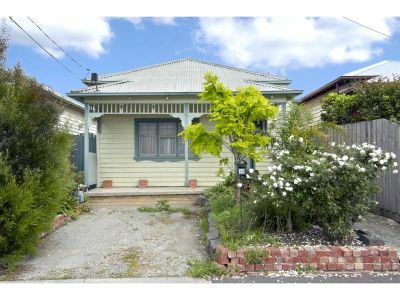 Our new house in Footscray is made of weatherboard, and although it looks small, it actually goes back a long way one room at a time, as you can see below on the plans. 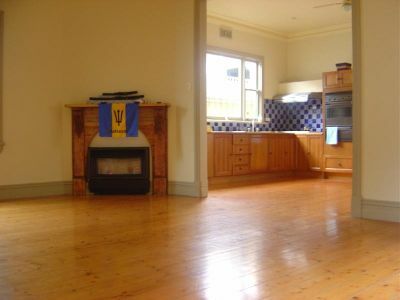 We have high ceilings, polished floorboards, open-plan living, and TWO verandas! Only a little garden but that’s enough for me. You can see things are a bit sparse yet, but we are building slowly and waiting for our London stuff to turn up too. The wall hanging that we had made for us in China takes pride of place in the lounge, strategically placed to look its best as you walk in the front door. 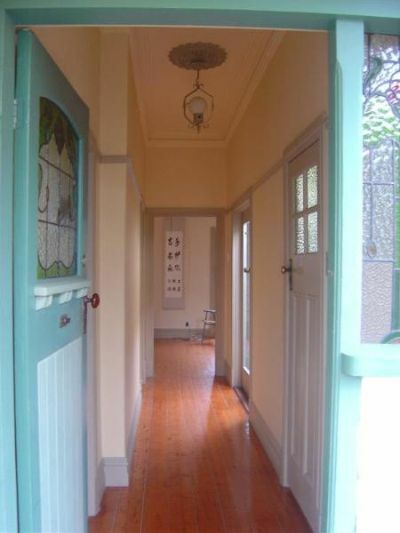 As you can see, the house is really bright because of all the doors and French windows! Our mantelpiece is a lovely feature, with Orlando’s Chinese swords, a big mirror above and lots of candles in the evening. More photos as we go along!